Our 2017 Edition of DoveTales is now available for Pre-order. Refugees and the Displaced includes work from artists and writers, established and emerging, from every continent of the globe (except Antarctica). You’ll also find there the winning entries from our 2016 Young Writers Contest. Order your copies of DoveTales now here. 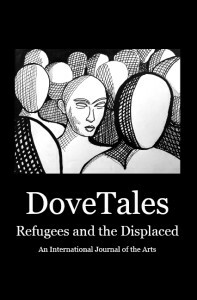 This entry was posted in DoveTales and tagged DoveTales, Refugees and the Displaced. Bookmark the permalink.